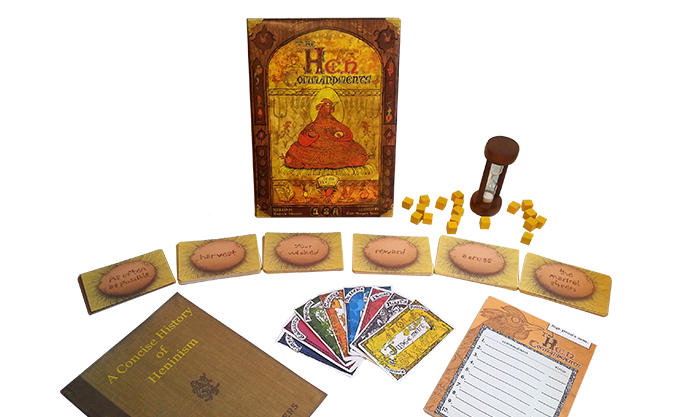 "She lays the law, you make the rules"
The Hen Commandments is probably the only chicken-based, religion-building party game in existence. This is a good thing. Years ago, in a practice called Alectryomancy, chickens were used to divine the future. Today, as fortold in the prophecy known as the 'Second Clucking', a holy chicken is laying eggs with mysterious messages on them; they are new commandments for a new future... THE HEN COMMANDMENTS! You are a disciple of Heninism, a little known and overlooked religion. It is your duty to interpret the holy chicken's confused commandments and convince all the other disciples that your reading is the correct one. 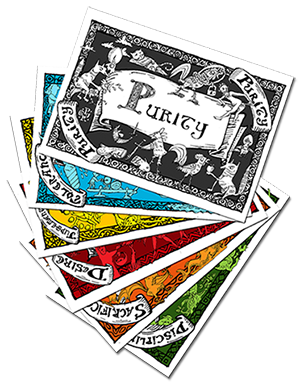 Try the online chicken wisdom generator to get an idea of the game. 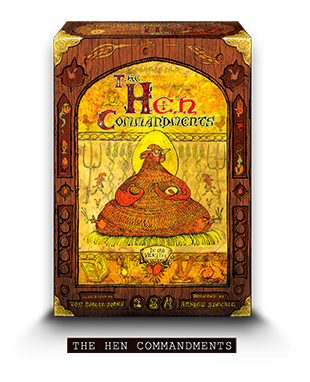 The Hen Commandments is perfect for... disciples of the Holy Chicken, group game situations, a quick filler (you can play just a few rounds if you want), the pub when conversation runs dry, an ice-breaker activity, linguists, religious scholars, philosophy students, bringing together people of all races, cultures and spiritual beliefs. The Preaching: Disciples reveal their chosen virtue card and each disciple with a unique virtue gets a further minute to explain their reading of the commandment in detail, with regard to their virtue. The Judgement: All the other disciples become judges for the round, and vote on which disciple gave the most compelling explanation of the commandment. The Reward: The disciple who gets the most votes is rewarded with 2 pieces of corn. Or, if the vote is split, those disciples get 1 piece of corn each. Canonisation: Play ten rounds, each time revealing a new commandment. The disciple who has collected the most corn is made into a Saint and rewarded with the record of all 10 commandments so they can go forth and start their own sect of Heninism. Right here, from the TerrorBull Games shop!